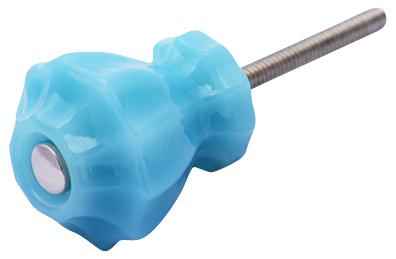 This old fashioned milk blue glass has been discontinued and this is the last of the remaining stock for this color. The glass design features a stunning decagon style shape. Made from the finest milk green color silica glass and were individually hand made by professional glassworkers. Measure 1 1/4 inches (32 mm) in diameter (measured from point to point on the hexagonal) and they have a projection of 1 1/4 inches (32 mm). Sold individually and come complete with the Chrome 2 1/2 inch hardware. Brass hardware and cap screws (for a flush finish on both sides) are available.